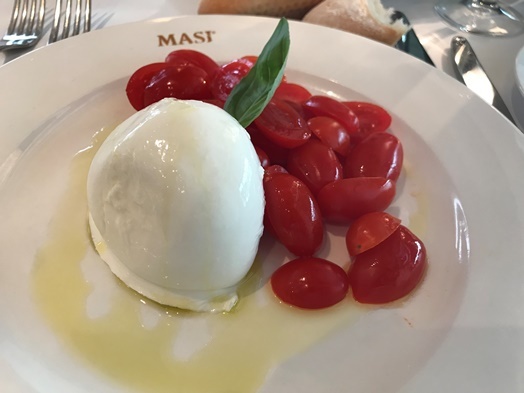 The Restaurant MASI Wine bar remains a favorite of mine for a quick and good lunch. The place is always crowded so it makes sense to book your table in advance. The service is jovial yet friendly and professional. The lunch offering is usually very reasonable in price but today I went for the “Mozzarella di Buffala (buffalo mozzarella, tomatoes, basil)” (CHF 19.00) from the menu and I must admit that it was good but the mozzarella di buffala was too salty for my personal gusto (and I really like salt). 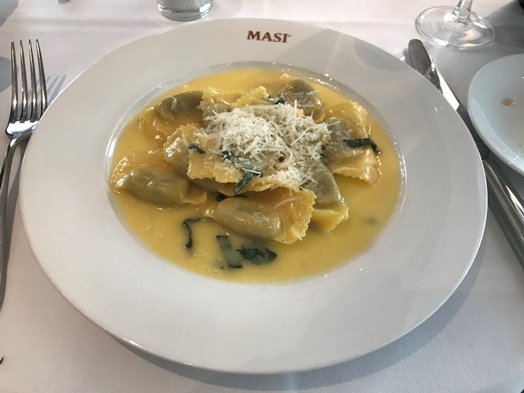 The “ravioli di vitello al burro e Salvia (veal ravioli with a butter sage sauce)” (CHF 25.00) were delicious! Very buttery but definitely delicious! The pasta was cooked perfectly al dente, the stuffing of the ravioli was well-seasoned and the sage added that little extra to the taste I like so much. Overall, the Masi Wine Bar is a good place for lunch – book your table in advance if you want to score a place. Also quite nice in the evening for a glass of wine.